Full drum sheet music for 9 computer music songs transcribed from the MIDI drum loops used on the album ‘Computer Games Music’ by TL Music Lessons. 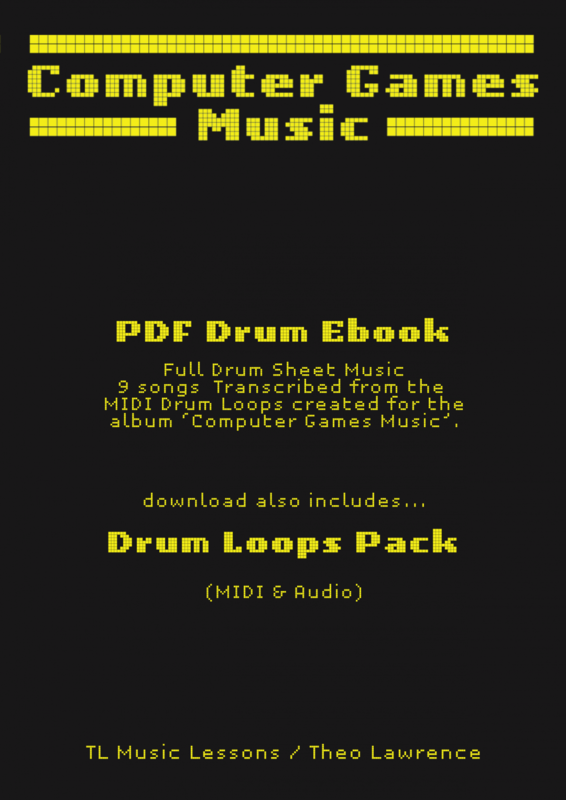 Also includes drum loops MIDI and Audio pack. The drum sheet music has a wide range of ability levels from complete beginner (Canon in C), right up to grade 8 with some complicated syncopation at high speeds. All of the drum loops were created specifically for these songs, by me, a drummer! Hence, I tried to make the majority of the beats playable by a real drummer. I was able to transcribe and transpose most of the beats without altering them, but there were some that would need extra hands, such as the hand claps and clave polyrhythms, so these have been left out or modified where I thought appropriate. I think this book would be usefuly for anyone wanting to enjoy playing drums along to music whilst reading drum sheet music at the same time. Whilst I can transcribe known songs, this was fun for me to do and release to you, without having to worry about copyright issues. These could potentially be used as performance pieces in schools, or maybe even exams as a free choice piece if you ask an exam board. Feel completely free to use the audio as a backing track by downloading it from itunes or bandcamp etc and usin it to play along with. Music makers and music producers can feel free to use the drum loops audio and midi as they wish. You may freely use them in your own compositions. School pupils may also use the drum loops pack as they wish for school projects or coursework – just ask your teacher if this is ok and within any guidelines. Last year I made an album of 10 songs to teach with, and created 6 ebooks for the instrument parts. This year, I made an album of 11 songs called ‘Computer Game Music’. This year I exported the MIDI files from 8 of those songs, plus 3 new ones, and began adding synths to the MIDI in my music production software Abelton Live 9 to create music that I think would sound good in computer games. I found it quite easy, quick and enjoyable to do when I initially messed about with one of the songs for fun. I then decided to start the project, which only took about a month of spare time to create the new album of songs. I also added drums and bass guitar to the tracks to finish them off. The drums were created by me in Abelton using the MIDI piano roll and a drum rack. I really enjoyed this! I then transcribed the drum loops into actual drum sheet music for people to learn to play along with the music if they wanted to. The drum sheet music has a wide range of ability levels from complete beginner (Canon in C), right up to grade 8 with some complicated syncopation at high speeds. All of the drum loops were created specifically for these songs. I tried to make the majority of the beats playable by a real drummer. I was able to transcribe and transpose most of the beats without altering them, but there were some that would need extra hands, such as the hand claps and clave polyrhythms, so these have been left out or modified where I thought appropriate. Music makers and music producers can feel free to use the drum loops audio and midi as they wish. You may freely use them in your own compositions. School pupils may also use the drum loops pack as they wish for school projects or coursework, if this is within the guidelines of the work. I hope that the songs can be used by a range of abilities. I would say most or all ability levels would find challenges throughout the album, depending on which instrument you look at. They are all quite challenging in places. I hope that the songs can be used by more advanced players. Initially the previous album of music was created for grades 1-3 (guitar and ukulele only), but now for this new one, I would say most or all ability levels would find challenges throughout the album, depending on which instrument you look at. They are all quite challenging in places. I also hope that the songs can be used as backing tracks for performances, for example in schools, and possibly as part of marked school performances or maybe even as free choice pieces in grade exams. I also hope that my students will enjoy listening to the album after getting to know the songs in their different style. Whilst the songs have not been created for any particular computer game, I will try to get some of the music featured in actual games. I think they would work well with platform and retro type games.